By this point, you have your intro, outtro, and stinger, and your raw audio file of your podcast. Time to clean that thing up using Audacity (instructions on installing in Part 1). You are welcome to try Audacity’s Editing Tutorial, but here’s my steps. 1. 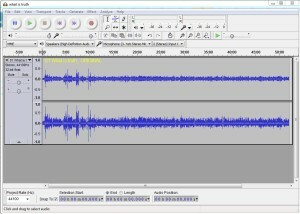 Open Audacity and open your audio file. 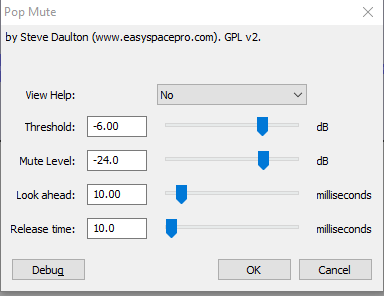 You should do this step before using any of the amplifying steps below – otherwise, you amplify the noise, and then when you try to remove it, you get artifacts, not during the silence, but during the remaining audio. If you have some background noise like a microphone hiss or buzz, you can remove it this way. 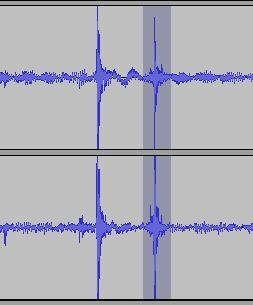 Find a part of the recording where only the noise occurs, and highlight at least 1 second of it. Click “OK” and the notch filter will remove any 6o cycle hum present. 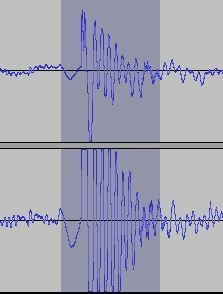 (The filter actually very selectively removes 60 cycle hum + its harmonics, 120, 180, 240, etc.). The frequency ranges filtered out in this step are so narrow that the loss will not be audible. If you are in a country that uses 50 cycle AC current, instead of the “60Hz + Harmonics” preset selection, choose “50Hz + Harmonics.” If you are sure there is no AC hum present in your waveform, you can forego this step. In order for the next step to work, you need to remove the places where audio spikes occurred (when these hit the max volume and distort, that’s called ‘clipping’). However, there are two different types of clipping, and each must be treated differently. 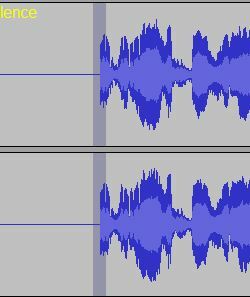 Audacity has a great pop removal filter which you can use. The standard settings are fine. Basically, zoom in on each clip, highlight the spike (as higlighted in the image directly above), and click DELETE. Then, go back and highlight around that segment and listen to it (click SPACEBAR after highlighting to play, or click the play button on the toolbar) and make sure it sounds ok. If it does not, UNDO, then move on to any others and attempt the same. Most of the time you wont’ be able to tell. 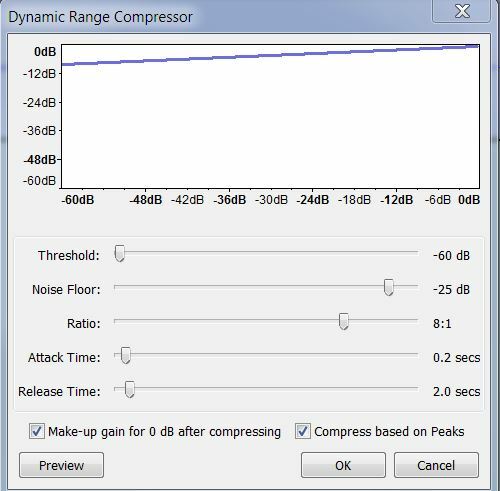 If the manual method doesn’t work on some or all of your spikes, you’ve probably got clipping, not from noise, but from your content, like when a speaker moves too close to the mic or shouts. 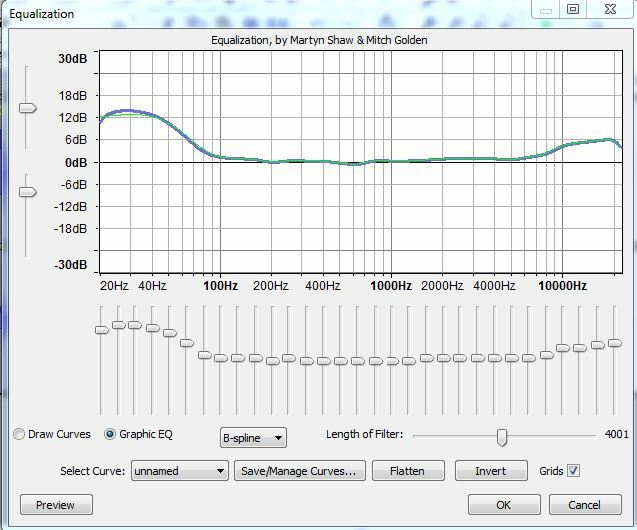 There’s not much you can do to fix distortion, but you can save your listeners’ ears from pain by cutting down the volume of those sections. 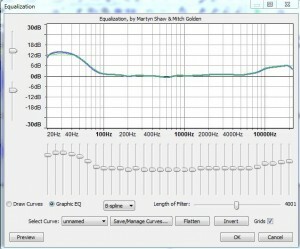 To give your audio more depth and clarity, changing some specific sound frequencies (top end and bottom) will make you sound better. There are some built in curves to help you get fun sounds like ‘walkie talkie’ or ‘AM radio,’ and you can download even more, such as the EM78 curve (XML file, import to get curve similar to mine above), and install them using this procedure. 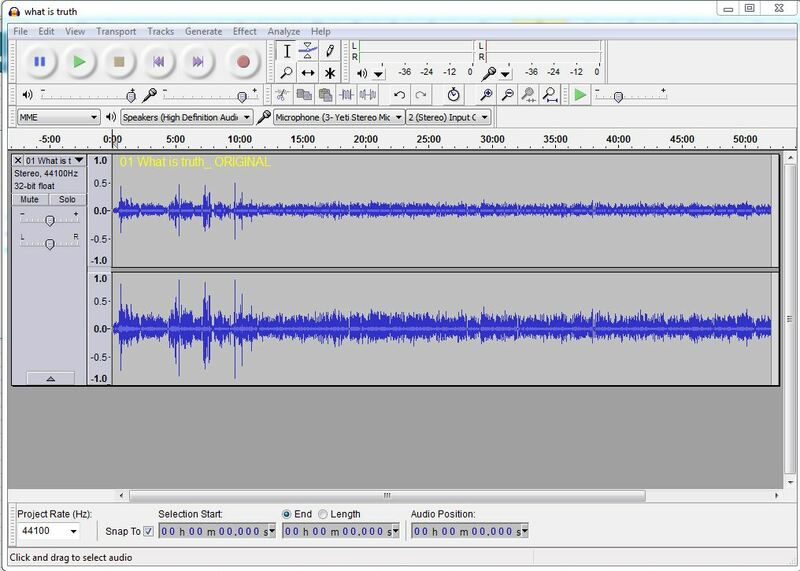 You can publish your podcast with any or all speech errors, but to sound pro, you might want to go through and delete such things as clicks, pops, ums, stutters, coughs, loud intakes of breath, and long pauses. This takes time, but is worth it. If you cut off part of a phrase, and are left with a sharp start or end to the remaining words, you can soften that using the FadeIn or FadeOut effect. All that’s left now is to add in the intro, outtro, and any stingers.